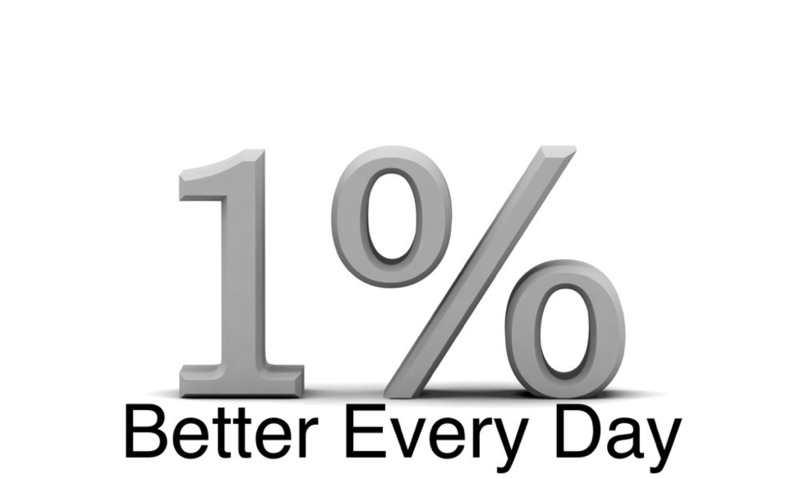 Home Blog What if you got 1% better every day? Lucille (my wife) thought I was having a mid-life crisis by signing up for two 5k races one week apart. For the first one she threatened my son Ryan into running with me. His job: make sure I did not croak during the race. I still don’t understand how he’d have helped if that happened other than for her to know sooner. It felt great to get started and as I jogged I thought about my times in the Downtown 5k over the years and gave mild thought to matching my best. I survived, and punched out a surprising 45:50 time proudly ahead of 11 fellow old guys (60+ age group). It was my fourth best time but paid for it as my 60 year old knees felt 75 and ached for days. The following Saturday I talked Lucille into doing one with me in our home town. I planned to walk with her and her walking buddy, Lisa, so I lined up with the two of them and tried to get comfortable with the thought that I would be okay with a ‘fast walk’ for a 5k ‘run,’ and a 55 minute time. When the race started, all that changed. My competitive nature kicked in, and I took off in a fast jog, weaving between the walkers and slow-joggers to a target I set out in the distance where I would slow to a fast-walk to pace myself. It did not take long for me to begin thinking I wanted to do better than my last time, and set small goals: jog without stopping from one target to another, then fast-walk to a new target and once there, set a new target to jog to. And so it went for the first two miles when I noticed I was on pace to match my time of a week earlier. Then my small goals changed again – I was liking what I was feeling about myself -- and picked up my pace. I recalled how I set simple goals for myself when running the mile in high school -- pass the guy in front of me -- and so that is how the final mile went. First it was the big guy who had been jogging ahead of me for the first two miles; then a small family with a baby in a stroller (I figured I could not let a 5 year old beat me); and then it was an equally old guy who seemed to have been shadowing me. We fist-bumped when I passed him for the last time. When I made it to the Mile 3 marker, I knew if I just kept up the pace, I would be close. So my small goal changed again. The last 2/10ths of a mile was on the school’s outdoor track which gave me the sensation I had while running on tracks like that more than 40 years ago. The finish line was alongside the stadium where onlookers had gathered to cheer on their friends. They began cheering me, seeing an old guy trying to finish strong. Which I did, and as I crossed the finish line, I saw that I had beat my time of the week before by nearly two minutes! It felt great. It was my second best time for a 5k. And I had done no preparation for it! As I reflected on the race in the weeks following (while my very achy knees were recovering) I began thinking I had reconnected with a simple way to make progress toward a goal and achieve it: beat yesterday. What a simple way to continually improve. Then this weekend, I began reading a few books on the topic of habit and found I had stumbled into something more powerful: that improving ever so slightly – even by 1% -- continually (or every day) over time would produce staggering results. In Atomic Habits, the author’s theory is that if you can get just 1% better each day, you’ll end up with results that are nearly 37 times better after one year! Another book, The Slight Edge, shares the same philosophy and retells the tale of the Tortoise and the Hare to make the point: over time, small daily actions result in an earth-shattering compound effect. While the improvement in my time from one race to the next was far from earth-shattering (it was just 3% better) I came away with a lesson that was worth many times better: improve ever so slightly every day – even by 1% -- and I’ll achieve outstanding results/outcomes over time! Just for fun, I put the formula to the test and found that a 1% improvement every business day in our per-day orders (from the beginning of the year to now) would yield a little over 12% more than we have right now – which was eye-opening! So I tested what it would look like at the end of the year, and it was a truly earth-shattering and staggeringly incredible result! And it would only take being 1% better every day! I encourage you to run your own test on your own key metrics. The results will astound you! This month’s Mylines was authored by Jim O'Donnell, our President, and is a reprint of one of his Morning Jim blogs which he shares with the company every Monday.